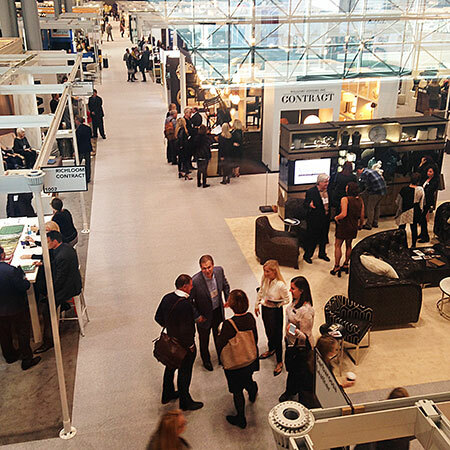 HX filled the Jacob K. Javits Convention Center in New York. Hotel representatives from around the world attended the show, event managers say. 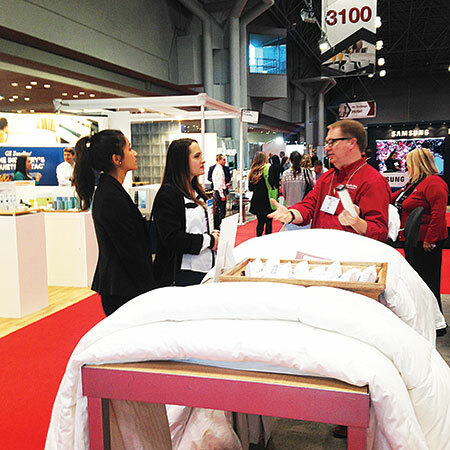 NEW YORK — Manufacturers of laundry machinery, linen and laundry chemicals exhibited a variety of cost-saving products at HX: The Hotel Experience, North America’s largest hospitality trade show for hotel and restaurant owners and managers. 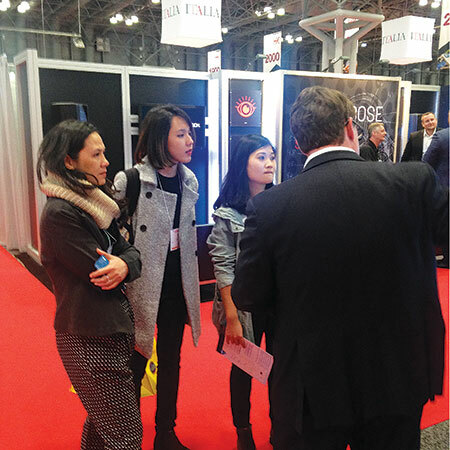 The energy- and water-saving products were introduced at the Jacob Javits Convention Center in New York on Nov. 13-15. Many smaller hotel groups are in the midst of building new properties or expanding, according to C. David Carter, vice president of North American sales for Pellerin Milnor Corp., a manufacturer of washing and drying machinery based in Kenner, La. The company exhibited a 60-pound-capacity washer in an exhibit space shared with Chicago Dryer Co., which exhibited its Comet Executive, an ironer for table linen in the small-hotel market. The equipment attracted the attention of Matthew Levin, director of hotels and marketing for the Bay View Collection, a group of three smaller hotel properties based in Camden, Maine. The properties include the Lord Camden Inn, the Grand Harbor Inn and 16 Bay View. HX has long been “a show of national importance for the hotel industry,” says Mats Bruce, executive vice president of B&C Technologies, a manufacturer of washing and drying equipment based in Panama City Beach, Fla. The show draws local hotel owners and operators, as well as owners and operators from all over the United States and abroad. G.A. Braun Inc., a manufacturer of washing, drying and finishing systems, is in the midst of a 100,000-square-foot expansion of its facilities in Syracuse, N.Y., according to Pamela Simonetti, director of marketing for the company. The expansion will double the company’s capacity to produce washer-extractors, dryers, tunnel systems and finishing equipment, she says. “We’ve experienced a big uptick in the sale of finishing equipment among hotels and linen companies,” adds Simonetti. Braun is not alone in its plans for expansion. Alliance Laundry Systems, whose UniMac brand manufactures washers and dryers, is currently undergoing a $60 million expansion of its facilities in Ripon, Wis., according to Aubrey Pollesch, marketing brand manager for the company. The company, which displayed washing and drying equipment at HX, is building a new warehouse and converting an old warehouse into a new manufacturing facility. Alliance Laundry Holdings Inc. added a line of soft-mount washers through the purchase of the Primus Laundry Equipment Group in 2014. The HX show also provided hotel operators and managers an important opportunity to connect directly with the manufacturers of laundry systems capable of reducing their operating costs. For Ofer Manor, general manager of Ocean Linen in North Miami Beach, Fla., that meant having an opportunity to view, firsthand, the laundry washers manufactured by Xeros and to meet with representatives of the company to close a deal. In addition to a 110-pound-capacity washer, Xeros was exhibiting a new 55-pound-capacity, variable-load, soft-mount machine, using its proprietary laundry bead washing technology, designed to reduce energy use by up to 80% and water use by up to 90% in cold water washing. Manor signed a purchase order at HX. Xeros has installed its equipment systems in more than 200 hotels, industrial laundries and firehouses since it introduced the new technology at HX in New York four years ago, according to David Kaupp, vice president of marketing for the company, based in Manchester, N.H.
TQ Industries, maker of Tecni-Quip carts, enjoyed success exhibiting at HX for the second time. "We were delighted with the reception and acceptance by hotel managers and housekeeping personnel of our aluminum-fabricated hotel carts," says Ryan Freudenberg, national sales manager for TQ Industries. "Our staff agreed there was a larger acceptance of our company's non-traditional-style carts and, in particular, our custom-designed carts than in the previous year." The chemical and textile corners of the laundry industry also promised important savings and advantages for hotel laundry operators. Ecolab has developed the Aquanomic Solid Laundry Program, which, combined with optimized low temperature chemistry, is designed to reduce water consumption by 30% and energy use by 40% in hotel laundries. The system uses a five-pound capsule of solid laundry detergent to wash goods in low temperatures and to eliminate the threat of chemical spills in the laundry from drums containing liquids. Procter & Gamble also offered hotels operational efficiencies and cost savings with its Tide Professional Coldwater detergent. Cold-water washing promises hotel laundries longer linen life and savings of up to 50% in energy and water costs. The hotel market now represents the largest segment in Tide’s professional laundry business, according to company representatives. Welspun U.S.A. displayed its Hygro Cotton towels, made from a proprietary spinning technology that produces yarn with a hollow core. The technology produces a more absorbent, longer-lasting towel, which can be washed up to 200 times in a hotel environment, according to Abhijit Datar, vice president and head of hospitality for the company based in Grove City, Ohio. “The HX show provides us with many good leads,” says Datar. The HX show also provided a good opportunity for Cuddledown, a manufacturer of sheets, blankets, comforters and pillows, based in Yarmouth, Maine. The company’s products have established a strong foothold in the hotel market, especially among boutique hotels, says Todd Cox, director of sales development. Growth in the hotel market has also provided a strong opportunity for distributors of laundry machinery, such as Professional Laundry Systems of Deer Park, N.Y. The company exhibited a 22-pound-capacity washer-dryer, a 35-pound-capacity washer-extractor and a 60-pound-capacity washer-extractor at HX. The company represents such brands as LG, Electrolux and Dexter. The company has experienced strong growth among both new and renovated hotel facilities, especially in Syracuse, Rochester and Buffalo, N.Y.
With the growth reported from the floor, HX 2016 was successful for laundry and linen companies and hotel properties alike. HX: The Hotel Experience will return to the Jacob K. Javits Center on Nov. 12-14, 2017. Richard Merli, who resides in Brooklyn, N.Y., is a former editor of American Laundry News.